Can Dmitri Medvedev create a Russian Silicon Valley? When Dmitri Medvedev became Russia’s president in 2008, he projected a very different image from that of his predecessor. Vladimir Putin is a buff former KGB agent who is fond of rugged pursuits, such as hunting and fishing, and is frequently photographed engaged in them without his shirt on. Medvedev is an elfin St. Petersburg-trained lawyer who enjoys chess and photography, practices yoga daily, and is the proud owner of the complete recordings of Deep Purple on vinyl. Where Putin’s economic vision seemed to consist solely of the crass exercise of Russia’s petro-power, Medvedev has called for the country to encourage entrepreneurship and compete with the West. Medvedev had traveled to Palo Alto to promote what is perhaps the signature initiative of his presidency: a Russian version of Silicon Valley, which will take the form of a brand-new city, located near Moscow, and which Medvedev hopes will kick-start the country’s knowledge economy. However, he explained to officials at Stanford University, most Russian entrepreneurs were reluctant to finance this sort of project. “Venture capitalism is not going so well,” he confessed. “No one wants to run the risk.” By coming to California, Medvedev hoped to enlist the Valley’s best minds in the effort. The reality, though, is a little more complicated. 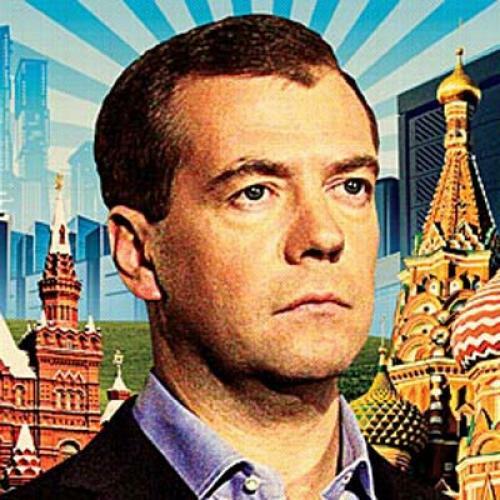 For all Medvedev’s cosmopolitan leanings, he is still what Russians call a gosudardsnik, a man of the state. (He was, after all, Putin’s favored protégé.) I met him three years ago, when Putin was still president and Medvedev was the first deputy prime minister. We sat in his office in the Kremlin, and he sketched for me on a notepad a triangle, with the political elite, the business elite, and the cultural elite represented at each point. These three forces must be in harmony, he told me, because, when they are in opposition, “this resulted in revolutions and economic and political collapse.” Recently, I thought of this philosophy—so alien to Western entrepreneurial culture—while watching Medvedev forge ahead with his quest to build a hub of creative thinking within a corruption-riddled, bureaucracy-loving, authoritarian state. Which side of his personality would come to define this venture: the technophile or the bureaucrat? During the Putin era, oil and gas were the salvation of Russia, rescuing the country from a deep recession. Today, hydrocarbons account for about 30 percent of direct foreign investment and 20 percent of GDP (investment in science, by contrast, only constitutes 1.5 percent). Recent events, however, have exposed the risks and the limits of Russia’s neartotal economic dependence on its natural resources. The other developing powerhouses—that is, China, India, and Brazil—all have more diverse economies and weathered the global downturn in far better shape than Russia, which was hit hard by the drop in oil prices. Its economy contracted by about 8 percent in 2009, making it one of the biggest casualties of the recession. There have been other indignities, too: In 2010, Russia had to stomach the news that the Nobel Prize for physics had been awarded jointly to a pair of Russian scientists, Andrei Geim and Konstantin Novoselov, who began their careers in their homeland but conducted their groundbreaking experiments abroad. That year brought another high-profile—if less prestigious—snub: Andrei Ternovskiy, who created the wildly popular webcam site Chatroulette.com when he was 17 years old, ditched Russia for Palo Alto, telling The New Yorker, “My perfect plan is that I don’t ever return.” Ternikovskiy joined around half a million Russian-speaking people living on the West Coast of the United States, many of them Bay Area mathematicians, programmers, and engineers. In the hope of reversing that trend, Medvedev made “modernization” a watchword of his presidency from the beginning. Then, in late 2009, he issued a decree forming a “working group for creation of a detached territorial complex for research and development and further commercialization of the results.” In early 2010, details about the new city began to emerge. Residents would be carefully chosen by a Kremlinsanctioned committee of specialists and would focus on five research priorities identified by the president: energy efficiency, information technology, telecommunications, biomedical research, and nuclear technology. The Kremlin has allotted $500 million to the initiative this year and up to $6.6 billion over the next three to five years (the total could ultimately reach tens of billions of dollars, one well-connected insider told me). After some debate, it was declared that the development would be called Innograd, or Innovation City. Innograd will be constructed near the woodsy village of Skolkovo, about twelve miles west of Moscow. The site, much of which previously belonged to a government agricultural agency, does not immediately call to mind either the balmy temperatures of Palo Alto or the rebellious spirit of 1960s California that produced a generation of entrepreneurs like Steve Jobs. The locale is nondescript, dotted with pine forests and weekend-retreat dachas built by wealthy Moscovites. Two architectural firms are competing for the Innograd contract—OMA, founded by the Dutch architect Rem Koolhaas, and arep of France. For now, however, the project website contains only assorted photos of commendable urban- and scientific-development projects—such as the Chelsea High Line in New York and the Purdue Research Park in Indiana—and vague pronouncements on desirable design principles, such as: “As world experience has shown, wooden house building is considered one of the most convenient, inexpensive, and eco-friendly housing technologies.” There will be new housing for 25,000 to 30,000 people, new schools, new sports grounds, new hospitals, a new legal regime, a new tax and customs system, and even a specially created police force—as if the import of anything from elsewhere in Russia would be a noxious contaminant. Yet, although Vekselberg may be a more respectable kind of oligarch, he is still an oligarch. In fact, a number of Innograd’s advisers who have been charged with creating Russia’s new economy happen to be the same people who shaped and profited from Russia’s old economy. They include Anatoly Chubais, the head of the State Nanotechnology Corp., or RUSNANO, who won a reputation as a radical free-marketeer during the Yeltsin era but has since accommodated himself to the state-centric capitalism of the PutinMedvedev years, and Vagit Alekperov, chief of the Russian oil giant Lukoil and a deputy energy minister in Soviet times. According to documents obtained by the Russian newspaper Vedomosti, the government may need to buy additional land for Innograd from the billionaire Roman Abramovich, owner of the Chelsea Football Club in England and yet another oil tycoon with close ties to the Kremlin. Past collaborations between Russian oligarchs and the West, it should be pointed out, have not always ended well. One cautionary tale is the $7 billion joint oil venture forged between BP and a small group of Russian owners in 2003, a deal that was blessed by both Putin and Tony Blair. Alas, the British and Russians were soon fighting over the crucial matter of management control of the enterprise. The Russian owners used their political clout to force the Brits to yield, and, in 2008, Russia booted BP’s top man in Russia, Robert Dudley, from the country and revoked his visa; Dudley temporarily went into hiding. One of the Russian owners of the joint venture was Viktor Vekselberg. For all the futuristic aspirations surrounding Innograd, there is one thing about it that is very familiar indeed: the peculiarly Russian obsession with the novy mir, the new world. The country’s history is littered with grandiose attempts to transcend the daily disillusionment of malfunctioning elevators, constipated bureaucracies, and tenement hallways that reek of stale cabbage. During the Soviet years, the Bolsheviks destroyed all vestiges of the old in order to forcibly create the Kremlin-blessed new. But the tradition is as old as Czar Peter’s invention of a new Russian imperial capital in the early eighteenth century—a “Venice of the North” on the banks of the Neva River, intended to turn the Russian mind away from provincial Moscow and prod it in the direction of cosmopolitan Europe. In that light, the Kremlin’s decision to locate Innograd at Moscow’s doorstep is telling. No place in Russia is more obeisant to authority than the greater Moscow area that encompasses Skolkovo. A Russian high-tech hotbed could conceivably be located almost anywhere in the vastness of Russia—after all, Silicon Valley is situated, happily for its residents, some 3,000 miles from Washington, D.C. St. Petersburg, Russia’s most progressive, Western-oriented metropolis, would have been a far better choice. For that matter, so would anywhere in Siberia. Paul Starobin, a former Moscow bureau chief for BusinessWeek, is the author of Five Roads to the Future: Power in the Next Global Age. This article ran in the February 17, 2011, issue of the magazine.